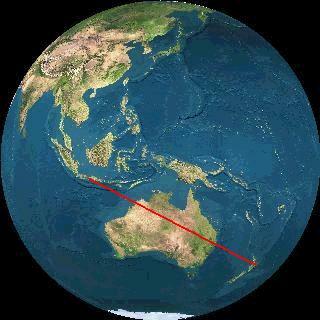 To get from Java to New Zealand you fly across Australia. 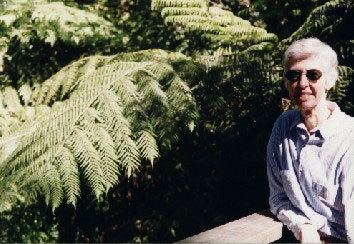 We travelled Yogya to Bali to Brisbane to Auckland. 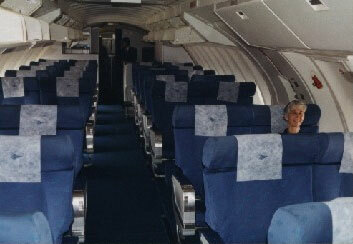 The Bali-Brisbane leg was 5 1/2 hours. Total flying time almost 8 hours. This is our first real vacation since moving to Indonesia in August. 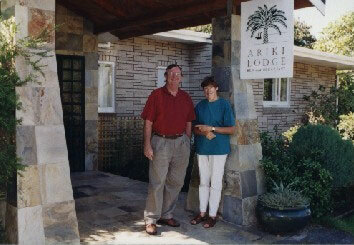 We landed in Auckland, picked up our rental car, and drove to Rotorua and the Ariki Lodge, a bed and breakfast. 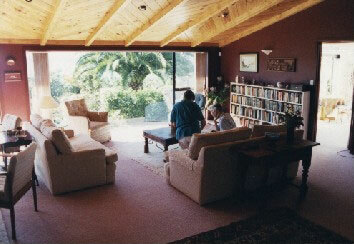 The public sitting area in Ariki Lodge, overlooking the lake. 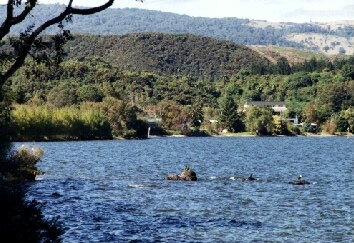 Standing by Lake Rotorua looking back at Ariki Lodge. 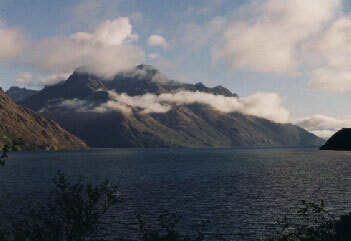 Standing by Ariki Lodge looking at the lake. 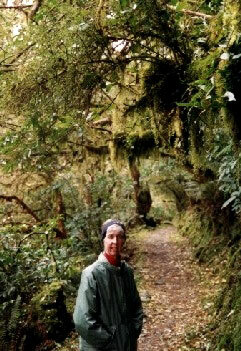 Hiking in a fern forest near Rotorua. 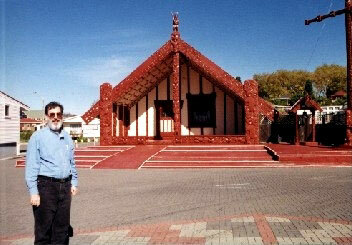 The marae at Rotorua. 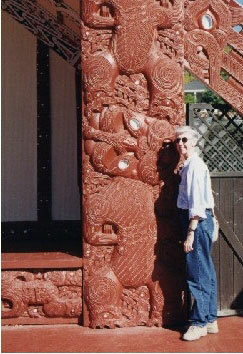 A marae is the public area, including a meeting house, in a Maori village. 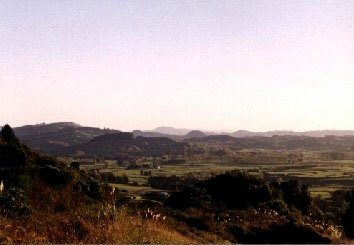 This original village is named Ohinemutu. 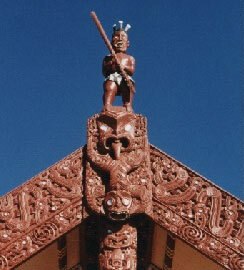 Carved face of the meeting house at the Rotorua marae. Clare Ann didn't realize it looked like she was getting a kiss. More detail of the meeting house carving. 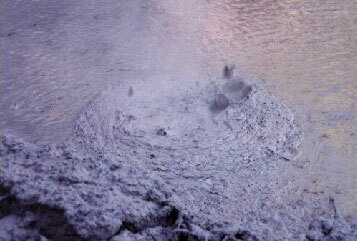 Rotorua is in a thermal area. The whole town has steam vents everywhere and smells strongly of sulfur. In the countryside steam rises from the ground. These mudpots are quite active. Driving south of Rotorua headed for our farmstay. 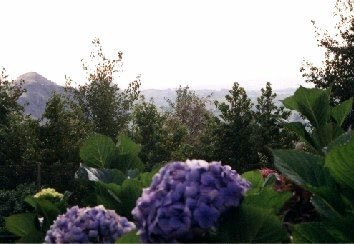 Pauiti farmstay is a working farm that receives guests like a bed and breakfast. 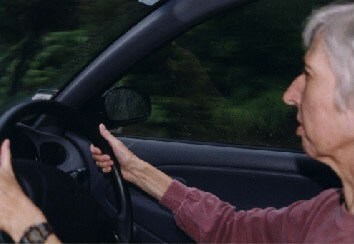 You go through a tall gate and drive a kilometer or so before finding the house, which is invisible from the road. It is surrounded by formal English gardens. Working farm it truly is. 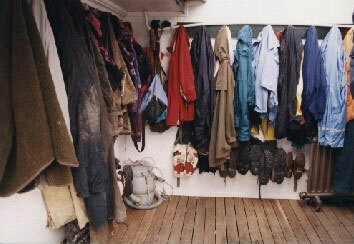 This is the mud room. 1200 acres raising deer and sheep, among other things. 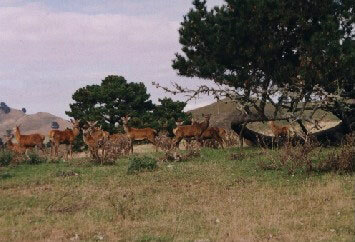 We had seen deer farms, but here you had to drive past hundreds of deer to get to the house. It turns out they have about 2,500. 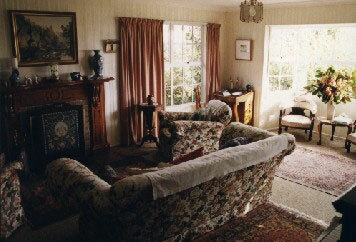 The house rambles along and is lived in, except for this formal parlor. 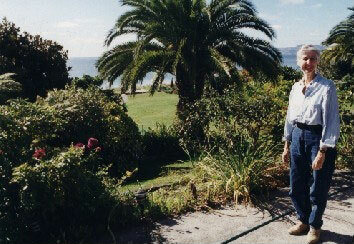 The English are serious about their gardens, and so are New Zealanders. There are garden tour guides and this house is in them. 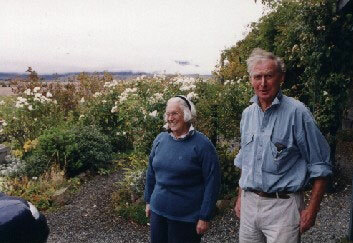 Phillip and Barb Hawken, our hosts. 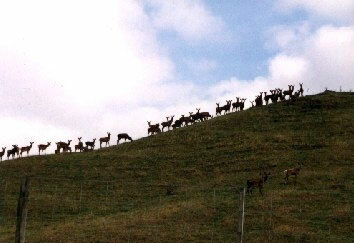 When they are about 16 months old the deer wind up in freezer bags headed for Malaysia or Canada. 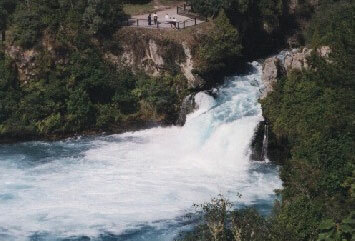 Huka Falls, south of Rotorua. 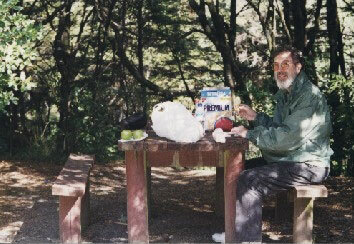 Picnic while wearing a jacket for about the first time in a year. 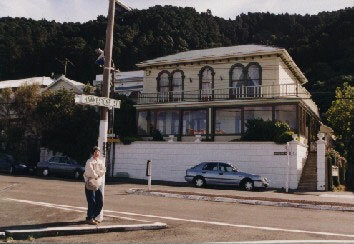 Made it to Wellington and found Tinakori Lodge, a small hotel. For the first time we had a reservation someplace for every night of the trip. The idea was to stay mostly in bed and breakfast places. That was a good choice since it meant we had real conversations with real people. In 1971 we spent time in Europe after finishing college. 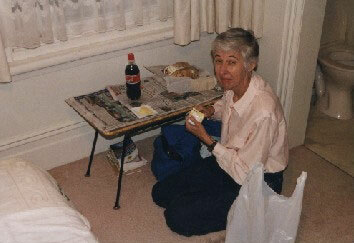 It was during a cold spell and we tended to have picnics in our hotel room. Here we are doing it again. A year of 85-95 degrees had thinned our blood. 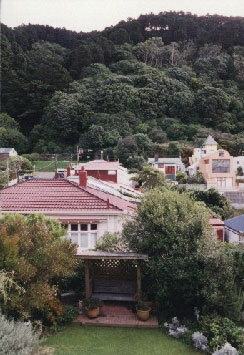 View out the back of Tinakori Lodge. 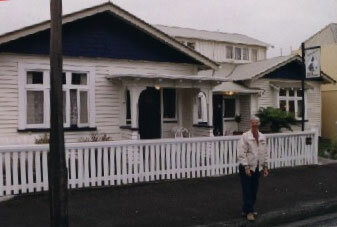 NZ Houses of Parliament. 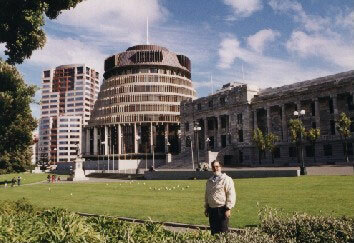 Affectionately known as The Beehive. 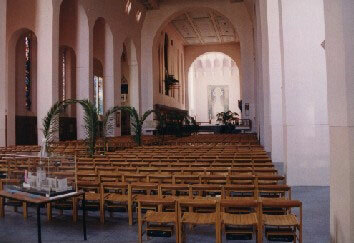 The Anglican cathedral was nearby, and that's where we attended Palm Sunday service. They had a real donkey and quite an organ, with two trumpet en chamade stops. 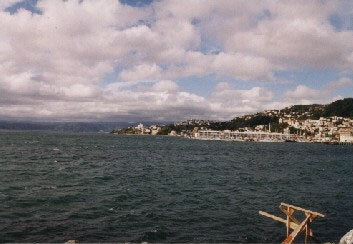 From Wellington we drove onto a ferry for the trip to the south island. 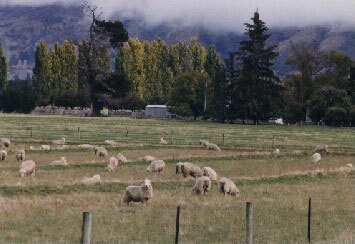 There are 3 million people in NZ, and most of them live on the north island. The south seemed deserted. It also looked just like California most places. 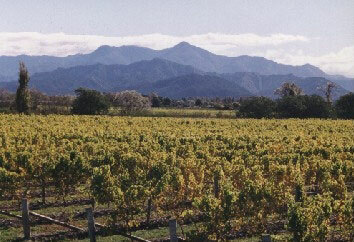 Here are grapes with the mountains behind, just like around Fresno. 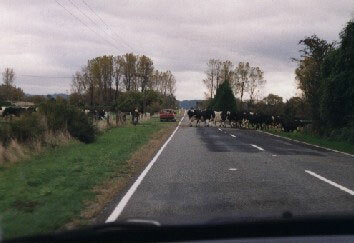 Not many cars, but there was a cow jam. 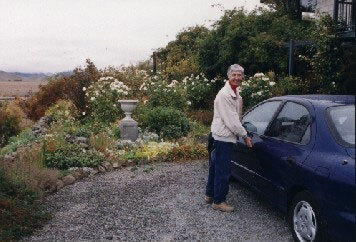 We headed to the west coast where about a third of the way down you find Teichelmann's Bed and Breakfast at Hokitika. 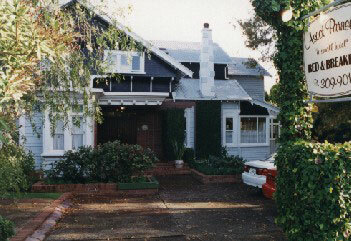 The name comes from a pioneer who owned the house. 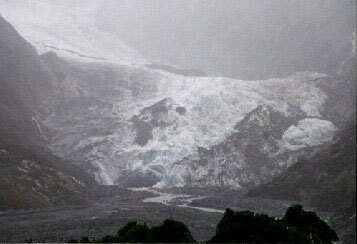 South of Hokitika is the Franz Josef glacier. 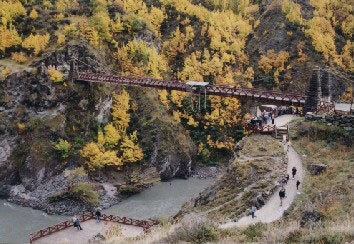 You drive in about 6 km to see it. Reminded me of the glacier we camped by in Alaska. It rained all day. 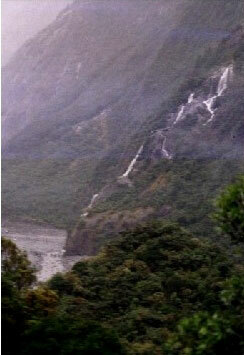 The glacier has retreated four kilometers since 1750, leaving a valley with waterfalls. 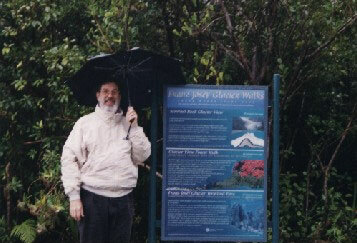 We didn't have much bad tourist weather, but this day we did. What's wrong with this picture? Nothing if you're from Indonesia. Folks in NZ have right-side-driver cars like Indonesia. We don't know what it is either. 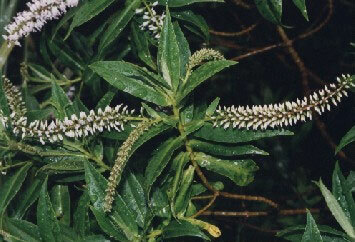 Nice plant. The gateway to Mt. Cook. 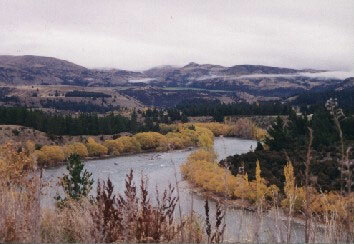 This river was lined mile after mile with yellow trees. Easter in the Fall, you know. 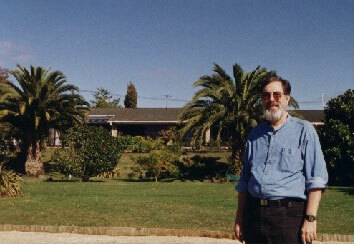 The Briars B&B at the entrance to Mt. 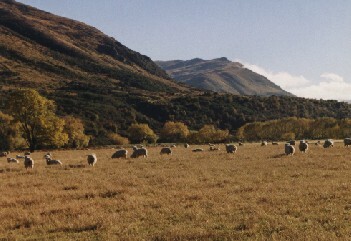 Cook Park north of Omarama. 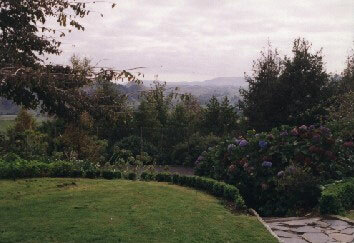 Another formal English garden on top of a hill. 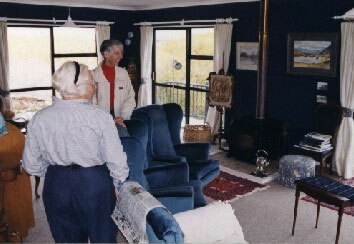 Our hostess in her living area. Had tea using a proper silver service. 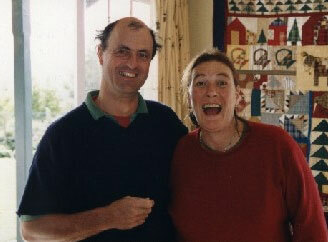 Owners of The Briars, Marylou and Don Blue. They are retired from farming. 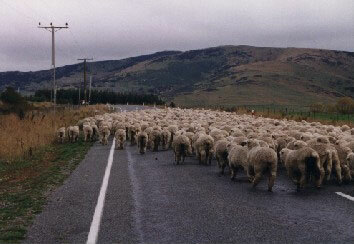 There really are a lot of sheep. 60,000,000. Heading south from Omarama to Milford Sound we happened upon the world's first commercial bungy jumping site on this historic bridge. A.J. 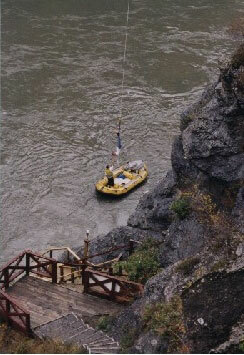 Hackett is the person who bungy jumped from the Eifel tower in 1987, then came here. People were actually doing it. There's a big video setup so you can watch live or on TV. US$50 for a jump with T-shirt and video. 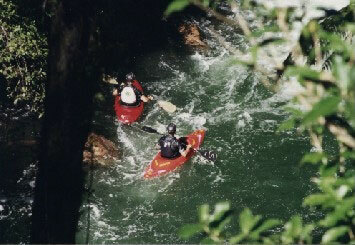 Here's how they recover the bodies. They have it figured out so exactly that you can tell them how far you want to go into the water. 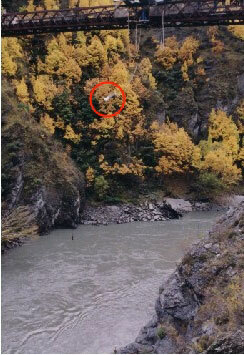 The jumper in the red circle is one the way up, about as high as they got. 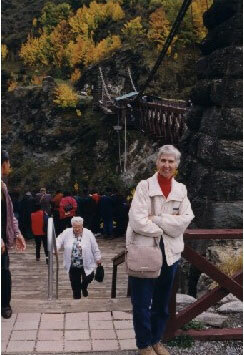 We had Clare Ann's cell phone for people who needed us in an emergency, and had counted on doing email in internet cafes. This is the only one we saw the whole time. Clare Ann was successful, but Duane not. Just before leaving he had sent a 10 mb file to someone, and it bounced, giving his email terminal constipation. 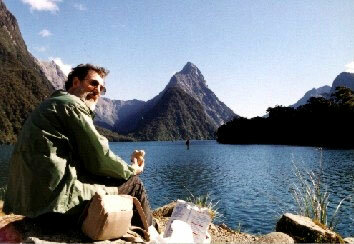 At Milford Sound in NZ Fiordland Duane interferes with a world famous view. 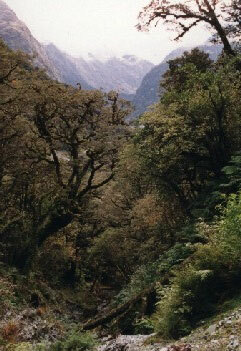 Hiking the Routeburn Track in Fiordland. An hour and a half each way was a great plenty. Back to Mt. Cook, which was gracious enough to clear for us. 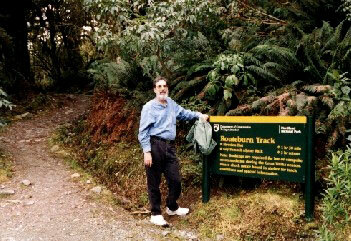 On the way to Mt. Cook. 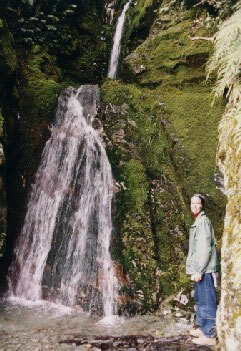 At the base of Mt. 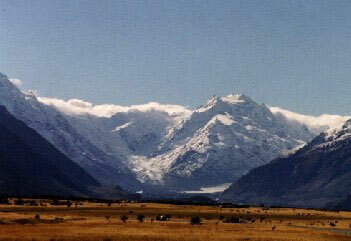 Cook you can see the Tasman Glacier, largest in the southern hemisphere. 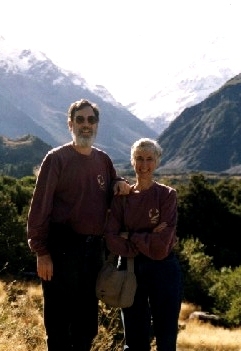 On our honeymoon 29 years and nine months ago we went backpacking and had our picture taken wearing purple t-shirts from Kansas State with a mountain behind. We're both the same height as then. 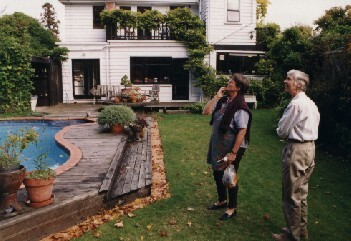 On to Christchurch and Pam Rattray's Fendalton House B&B. Fed the ducks on the river behind. 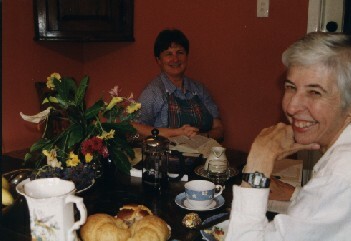 Flew back to Auckland and stayed at Ascot Parnell B&B, a small hotel run by a Flemish couple. 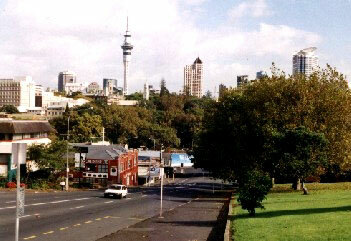 View of Auckland. We headed to the north side across the bay for the Just Peace? conference at Massie University that brought us here. Duane presented a paper on applying restorative justice principles to reconciliation in Indonesia. Clare Ann stayed two more days then headed to Bali for MCC regional Country Rep retreat. Prepared by Duane Ruth-Heffelbower. 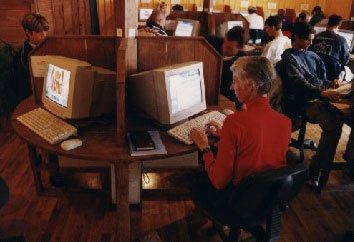 visitors since December 26, 2001.